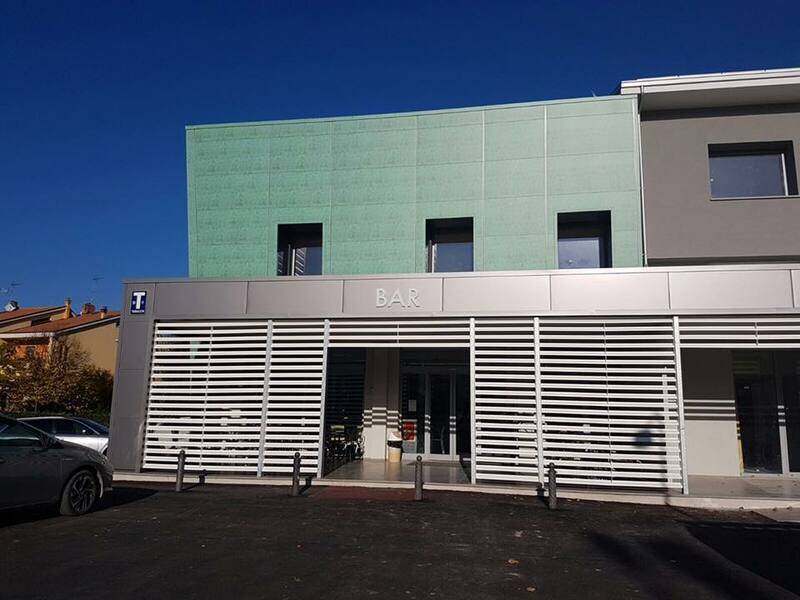 The insulated metal panels called “TERMOCOPERTURE ® “ & “TERMOPARETI ® ” (® registered trade names) are the well-known monolithic panels designed and manufactured by ELCOM SYSTEM S.p.A (company certified UNI EN ISO 9001) to offer the best in the field of light prefabrication. With these panels it is possible to realize roofing, exterior and interior walls and ceilings as well as for any size of prefabricated industrial, commercial, agricultural and zootechny projects. For projects with special architectural requirements, the company produces particular insulated components in perfect fit with the panels (90 degrees and several curved connections) so as to reach a high aesthetic standard. External steel supports formed by profiling of cold rolled coils of different materials such as : Carbon Steel , Aluminium , Copper , Stainless steel. The finishing of steel and aluminium supports can be organic polyester prepainting or on request different coatings such as PVC alimentary suitable for food industry or PVDF e.t.c. Insulating material is polyurethane foam without CFC self-extinguishing (PUR) with components according to UN EN 13165 norms and key features such as: density 40-42 kg/m3 – compressive strength of 140-150 KPa-impermeability 98% percentage of closed cells. On request, the insulating material can be foam with fire reaction class E according EN ISO 11925-2, panel class B-S3 D0 in EN 13823 (SBI TEST). For special cases, the foam can be made from polyisocyanates (PIR) which by their nature have very good behavior to fire and panel class B-S2 D0 in EN 13501-1. The roof panels feature high external tables in cross section (h = 45mm) and at an angle with the straight sections approaching 90 degrees. They also have double joint system, both on the upper side and the internal one reducing the risk of condensation. The panels of ELCOM SYSTEM are produced according to standard EN 14509 and have CE mark. Finally, the production program of the company offers a full range of trapezoidal sheets for use in ceiling and sidewall and those for use in the construction of composite floors. 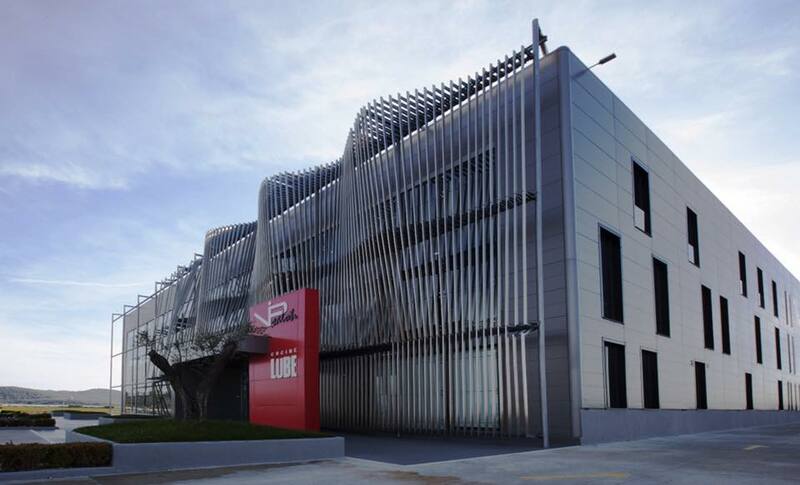 ELCOM SYSTEM presents the integrated architectural facades system SERBOND ®. This system has been developed to offer designers the ability to create projects “on demand» (Tailor made) having not to refer to rigid standards or defined geometric forms. This particular facing system is mainly directed towards commercial and industrial buildings, offices and residential buildings. It can be used in both new and renovated buildings. Due to the variety of accessories, the system can be employed n any type of structure such as concrete, traditional masonry, steel and wood. The erection of the panels , supported by our technical assistance during the planning phase, is easy and can be effected without the use of special equipment. The system shows great adaptability to customer’s requirements and can be used all the range of wall panels such as flat panel and the panels BUBBLE & RUGBY with the pressed spherical or elliptical imprints on their outer surface. The SERBOND system adapts to bearing structure of the building through a light substructure made of galvanized steel. Monolithic sandwich panels with stabilized flatness have joints with thermic cut and hidden fixing support, and are specially designed to be finished with special profiles in extruded aluminium. The panels can be mounted in a vertical or horizontal development. The system also offers a wide variety of thermal insulated elements, rounded and right corners , spherical and prismatic joints, edges, threshold, windowposts and even panels with special development and customized joints. 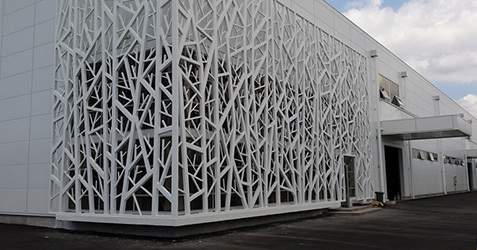 ELCOM SYSTEM presents the renewed architectural wall system called TUDERBOND ®. The system consists of a reticular frame with steel profiles anchored to the main structure of the building, interchangeable cladding panels together with corresponding fittings and static air space. Tubular profiles in galvanized steel vertically and/or horizontally arranged and fixed to the bearing structure of the building by means of a suitable joint system. External support in flat 0,6 mm sheet of galvanized steel or aluminium or staineless steel or cor-ten. The corners are rounded and drawn without sheet interruption on the coined visible face. Internal support in 0,5 mm galvanized steel. Insulation of polyurethane , CFC free according to UNI EN 13165 of density approx. 40kg/m3. The system foresees a static or ventilated air gap between the architectural wall clading and th einternal wall that permits the transpiration of the latter, protects the structures against atmospherical agents, improves the thermo-accoustic insulation and avoids loss of heat from inside towards outside. The particular configuration of the ends of the panels and the use of special aluminum profile with gasket ensures perfect adaptation against atmospheric influences. This renewed system enables creation of horizontal and vertical joints in the same color and texture. The new panels “TERMOPARETI ® ” BUBBLE & RUGBY (patented products) are designed to produce a unique and original architectural result. 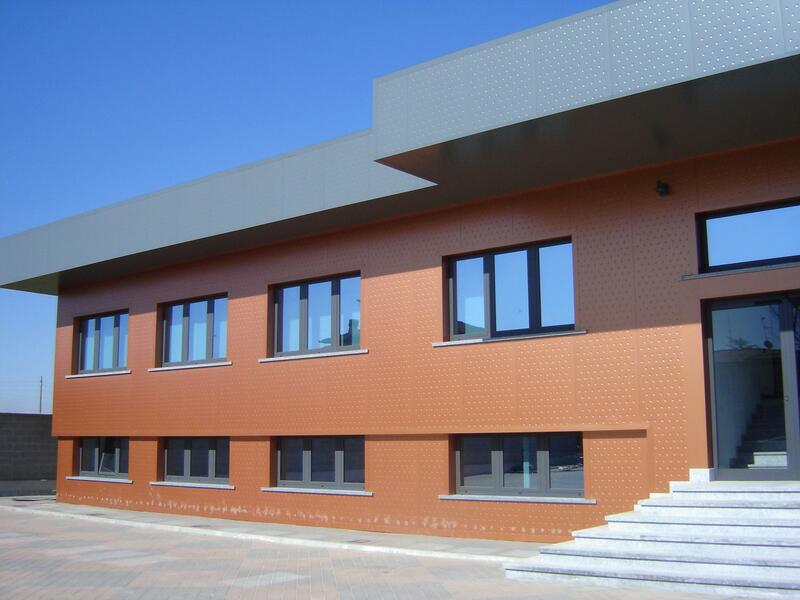 Produced in various colors and thicknesses for use in structures, industrial and commercial buildings, office buildings and housing, both new and renovated buildings, on continuousand/or discontinuous external walls, internal partitions and ceilings giving a sense of otherness in relation to the simple conventional panels. 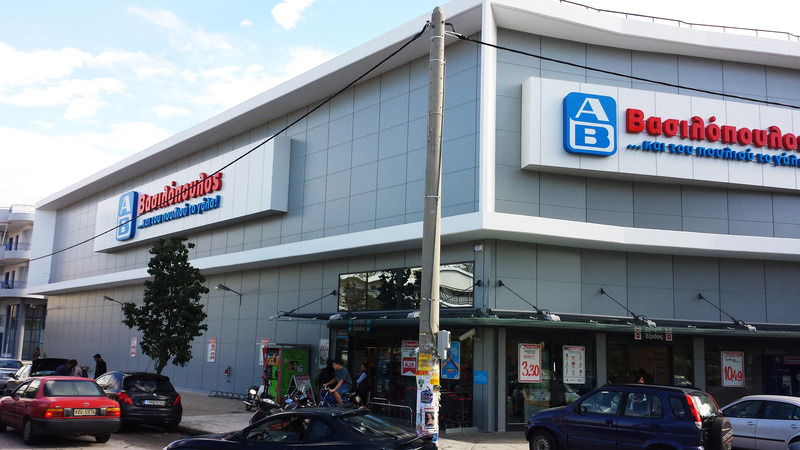 Due to their characteristics these products find applications in constructions with high and unique architectural standards. 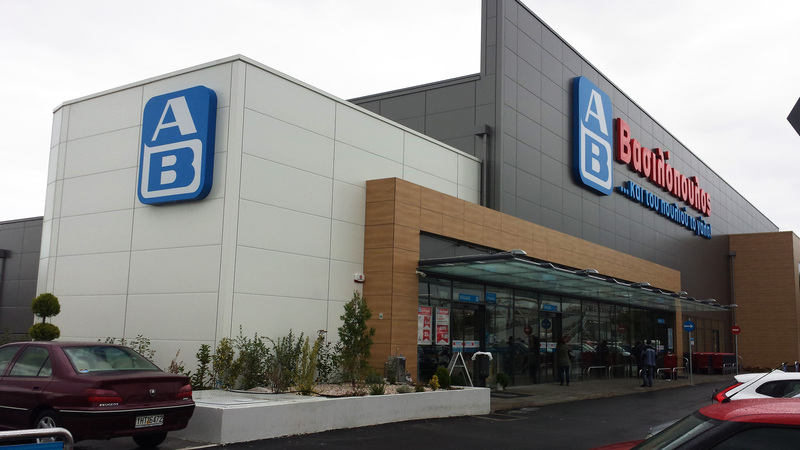 They can be placed in any type of structure: metal, reinforced concrete or wood. The panels are placed vertically, horizontally or inclined and are equiped with hidden fixing coupling with a special strengthening support of PVC in the female part of the joint. The main feature of these panels is that they have across the outer surface spherical (BUBBLE) or elliptical (RUGBY) imprints formed a special pressing on flat plate, so as to give an high aesthetic result.Ta imprints are negative respective the external side of the support and they can be realized on different materials , such as galvanized and/or pre-painted steel , aluminum, stainless steel and copper. 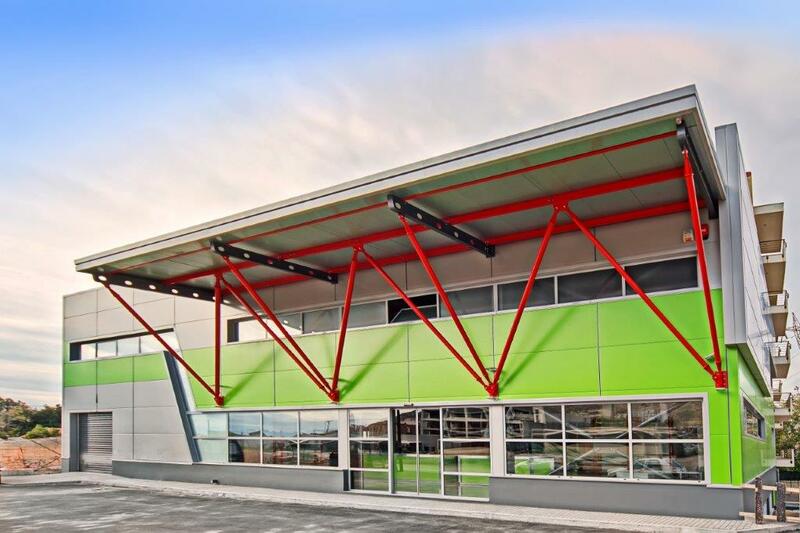 A wide variety of thermal insulated finishes, curved and rectangular corners, spherical and prismatic joints, complete even more TERMOPARETI ® panels BUBBLE & RUGBY. 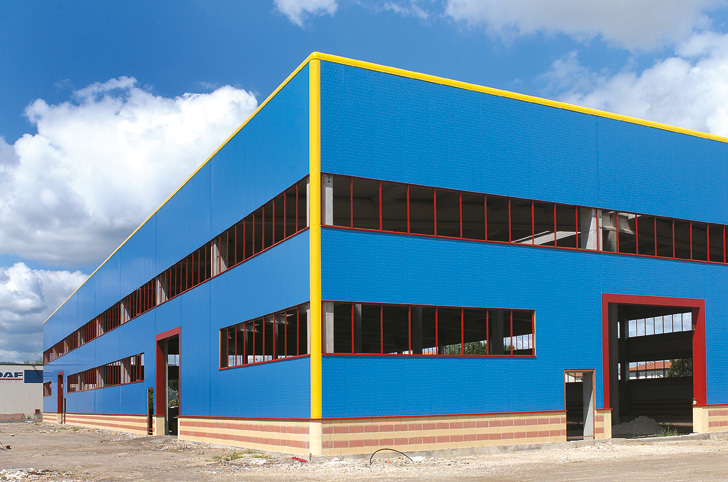 ELCOM SYSTEM produces variant roof panels series ZOOTEC specially deisigned for zootechny and agricultural units. The panels are produced with a special internal surface of P.R.F.V Fiberglass (polyester resins reinforced with fiber glass) white opaline. Further technical data are similar to those of normal roof panels. Based on the above panels ZOOTEC retain the advantages of the common roof panels such as high thermal insulation properties, light weight and versatility in new and existing structures. Additionally, however, the use of Fiberglass helps to increase resistance in an environment with biological exhalations (bacteriums, urea, ammonia). 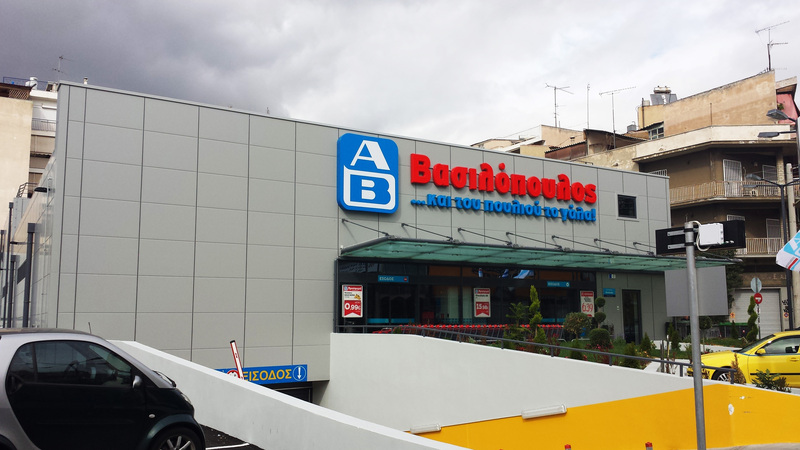 The AEFFE Series Panels, ATHOS AND OLYMPOS are made by locating two metal supports on-going process with a mat of mineral wool. It has an elevated fire resistance performance. The test of fire-reaction have been executed by an authorized laboratory (Istituto Giordano S.p.a.) using equipments as request in the Circular 91, issued by the Ministry of Internal Affairs. 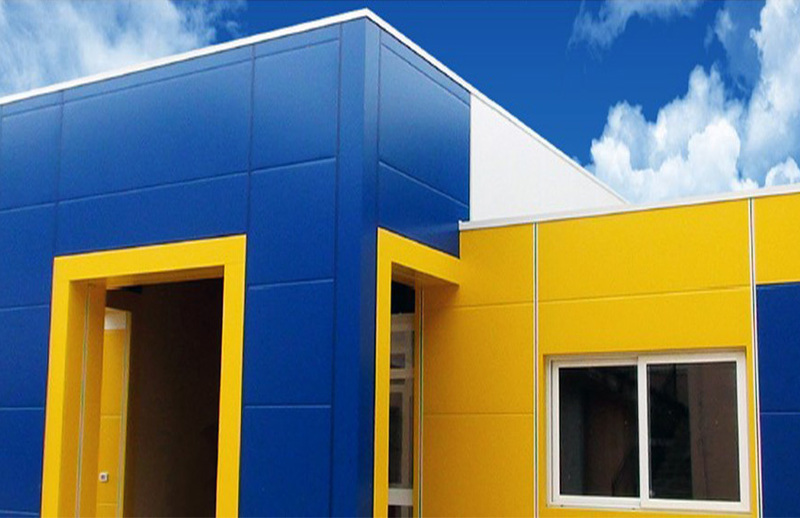 During the planning stage, the prototypes have been tested in the laboratories of Elcom System S.p.a.
Fitting right corner of polymer, glass joint corner of polymer, polymer siding curved corner, horizontal siding curved foam, foam vertical angle curved.